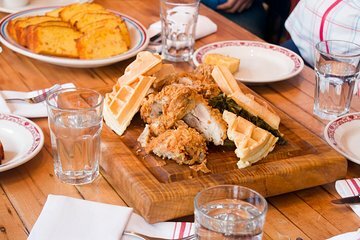 Assapora la scena eclettica del cibo di Harlem con un tour a piedi di 4 ore. Assaggia l'anima tradizionale, la cucina africana e i morsi caraibici mentre esplori il quartiere a piedi con una guida locale. Ascolta come la tua guida ti riempie sulla ricca storia, cultura e tradizioni del vivace quartiere. Assicurati di portare l'appetito, non lascerai la fame; andrai via con una lista di ristoranti in cui puoi tornare in futuro. One of the BEST tours i've ever been on! The food was AMAZING and there was so much. We were stuffed by the end. The tour guide did a great job of giving the history of the area. It is, however, a lot of walking so be prepared! This gal, Jacqueline Orange, really knows Harlem and so she pased on all that knowledge to our tour group. Loved her and how she presented this most interesting part of Manhatten. The food was fantastic too! The tour started off well, at a restaurant with chicken and waffles. However, the tour wasn't what I expected. One of the stops of this food tour was at a grocery store, where the guide bought food from the store's deli. At times, the guide would just start walking crossing the street without us knowing to follow her. Both my co-traveler and I were disappointed in the tour. A positive part of the tour...the guide was extremely nice, so I don't take anything away from her personally. Phenomenal tour and experience! For locals or for those traveling from afar, this tour is not to be missed. The food was delicious, but most importantly our tour guide did an excellent job in explaining the culture and history of Harlem. of what formed Harlem and how it has ebbed and flowed and changed over the years. Excellent day. That is a great tour exploring Harlem and the amazing food choice. Thanks to our guide Ms Jacqueline Orange. She told us a lot about the Harlem history, how much changes that had been going on in recent decade. She took us to several places to taste food like chicken waffle, soul food good and value for money, amazing french pasteries and African food. The restaurant that serves the African food is so delicious i have already recommended my friend who is a NY resident to check out this place. A very wonderful tour that brought much joy to us despite the wet and windy weather we had that day. We had an exceptional time, not only was this a food tour but a history lesson on Harlem. Highly recommend. Jackie was wonderful...good food, great historical and current information on Harlem, excellent stories and tales...I definitely highly recommend this tour with Jackie!! !